Greece – a country located in Southern Europe. The capital of Greece – Athens. The population of more than 11 million people. The total area of ​​131,957 sq.km. Official language – Greek, religion – Orthodox Christianity. Currency – Euro. Greece borders with Albania, Bulgaria, Macedonia and Turkey. Washed five seas: Aegean, Thracian, Ionian, Mediterranean and Crete. Major cities Larissa, Patra, Komotini, Thessaloniki, Lamia, Ioannina, Heraklion. Major rivers – Evros, Haliacmon, Nestos, Strymon. Large lakes – Lake Trichonida, Lake Volvi, Vegoritis. The larger islands – Crete, Euboea, Lesbos, Rhodes and Kefalonia. The most well-known resorts – Corfu, Kos, Crete, Rhodes, Santorini, Halkidiki, Zakynthos, Loutraki, Kastoria. Swimming season in Greece begins around May and ends in late October. Meteora – a large monastery complex in the north of Greece, is literally floating in the air. 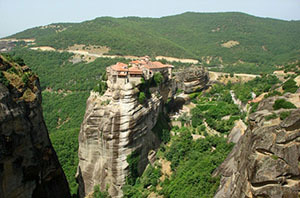 These monasteries are located on a cliff top in height of 300-600 m. The word meteora in Greek means “soaring”. For the first time the priests climbed the cliffs of Thessaly in the 11th century, to be alone with God, and monasteries were built in 14-15 centuries. Soon their number exceeded twenty. It is hard to imagine how people in those days, went up the most top. Even today, many climbers do not risk climbing the steep, steep wall. On the other hand, given the fact that the monasteries were built in times of uncertainty and the increased popularity of seclusion, one can understand why the monks were collected so far. For them, these rocks were shelter, a refuge from persecution and secular traditions. In the Middle Ages pilgrims and worshipers raised in their hard refuge via secret networks that are no worse than modern funicular. Fantastic landscapes, opening here, Thessaly turned into one of the most exciting regions in the world. Incredibly, once there was a prehistoric sea, and the rocks themselves were its rocky bottom. 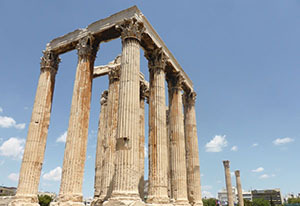 Temple of Olympian Zeus – the largest temple in Greece, built in Athens in the VI-II centuries. BC. Geographically, the temple is located near the Acropolis. Undoubtedly, this is one of the main objects of the Greek capital. Sometimes it is called the Temple of Olympic Zeus. Today, from the Temple of Zeus we were alone only majestic ruins. Despite the fact that the pillars supporting the dome, almost destroyed, they point to the sophistication of ancient Greek architecture. Construction of this facility was led by tyrannical ruler Pisistratus (Hippocrates son). Begun them, continued by his son Hippias, but he was soon deposed and construction on time has stopped. Despite this, in the V century BC Themistocles did manage to use the temple as a defensive wall. Large-scale construction was deployed with the arrival of Alexander the Great in Athens, which belongs to the III century BC During this period, King Antiochus IV ordered the Greeks to one of the best Roman architects to build the largest temple in the world. However, the construction was stopped again with the death of the king. Finishing touches to this religious building made Emperor Hadrian, reputed huge admirer of Greek culture. On his orders, in the center of the temple erected a statue of Zeus and another statue showing the Emperor himself. Today, from the ancient Greek shrine it remains only 16 columns, topped with Corinthian capitals, two of which are separate and one has tumbled down. They are believed to belong to the period of Antiochus. Statue of differ giant size and magnificence. It was created by the great sculptor Phidias. The area of ​​the temple is open to visitors daily from 8.30 am, a day off – Monday. The nearest metro station – the Acropolis. Graceful ruins can also be admired from the heights of the Acropolis. Even at night they lit backlight time. 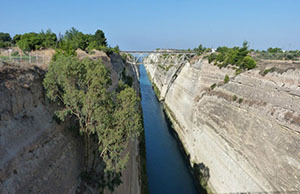 Corinth Canal – the narrowest navigable channel in the world; man-made miracle, built in the second half of the 19th century. The channel connects the Greek mainland with a picturesque peninsula of Peloponnese. It got its name in honor of the city of Corinth, framing the western extremity. water path length is about 6.5 km. The entire perimeter of the channel is surrounded by 76-foot wall, making it similar to a cave passageway. Through it pass three road bridges and one railway. channel walls have a natural limestone origin. During the construction of used technologies and experience in the construction of the Suez and Panama canals. Attempts to hold the channel in the region since ancient times were made. So, one of the Corinthian rulers tried to build it even in the 7th century BC Quickly noticed that the level of the Aegean and Ionian seas is different, he ordered to stop work. According to another version, the pagan gods had forbidden him to create a land bridge at this location. The next ruler, thought of laying channel, was the Macedonian king Demetrius I. At the beginning of the 4th century BC he invited Egyptian engineers to implement their plans, but they assured him that due to different levels of water in the bays, there may come flooding of surrounding areas and islands. Do not throw this idea and Julius Caesar, Caligula, Nero, Galba’s successor, Herod Atticus. However, it could be carried out only in the second half of the 19th century. 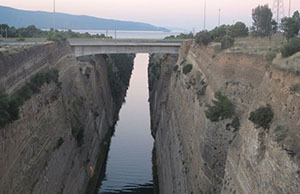 Construction of the Corinth Canal was carried out almost 12 years, and was associated with high financial costs. With his appearance ships cut their way for 400 kilometers. On the occasion of the opening of the channel in 1893 it took a real triumph. The Greek government and the local people were well aware how important it is for the development of the country. At the moment, he no longer has such economic importance, and on bridges outdoor enthusiasts practicing BASE jumping. Because of the narrowness of the passage (of 21.3 m), large vessels and ships through Corinth Canal persist. Tourists are particularly attracted by the picturesque panorama of the channel in the vicinity. Next to it you can not only admire the passing ships, but also to observe the breeding of bridges. By the way, every year passes through the canal about 11 thousand ships. The best way to enjoy the extraordinary beauty of the Greek sights on board a yacht or a small boat. Until Corinth from Athens airport are regular trains and buses. Travel time – about 1.5 hours. 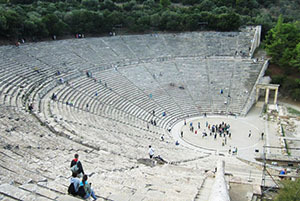 Theater of Epidaurus – one of the oldest theaters in Greece, known for its excellent acoustics. Located in the city of Epidaurus in the eastern Peloponnese. This ancient town from time immemorial considered a sacred hospitals, as the locals worshiped the god of healing – Asklepios. The most famous architectural object in it is the theater. The theater was built in IV-III centuries. BC. Its construction was directly connected with the cult of healing. The ancient Greeks considered if patients entertaining theatrical performances, the healing process is accelerated, and in this they were not mistaken. Generally healing worship of Asklepios Epidaurus brought immense popularity and prestige. More than three centuries old city flourished until it was plundered the Romans. During this time there have appeared temples, baths, gymnasium. Today in Greece, everyone knows that in this theater of magnificent acoustics. It seats about 14 thousand spectators. In the summer, there are always concerts are held in the framework of the Athens Festival. 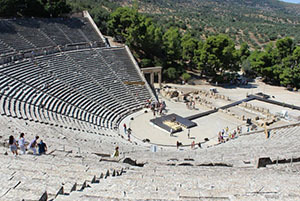 Theater of Epidaurus is quite popular among tourists. It is hard to imagine, but to the excavations carried out in the XIX century, no one knew that the remains of the ancient amphitheater survived. Geographically, the theater is located in a hilly area and is surrounded by forest. Perhaps this is due to its excellent acoustics. Even the light sound of the burning match on the stage or hit the coins on the stone perfectly audible in the last rows. You can reach it by bus from Athens in approximately 2 hours. The Parthenon in Athens – a monument of ancient architecture in Greece; the main temple of ancient Athens. This is one of the most famous buildings in the world. For over 2500 years, it adorns the top of the Acropolis. The Parthenon is not only a part of the cult of the architectural ensemble, but also its most significant object. 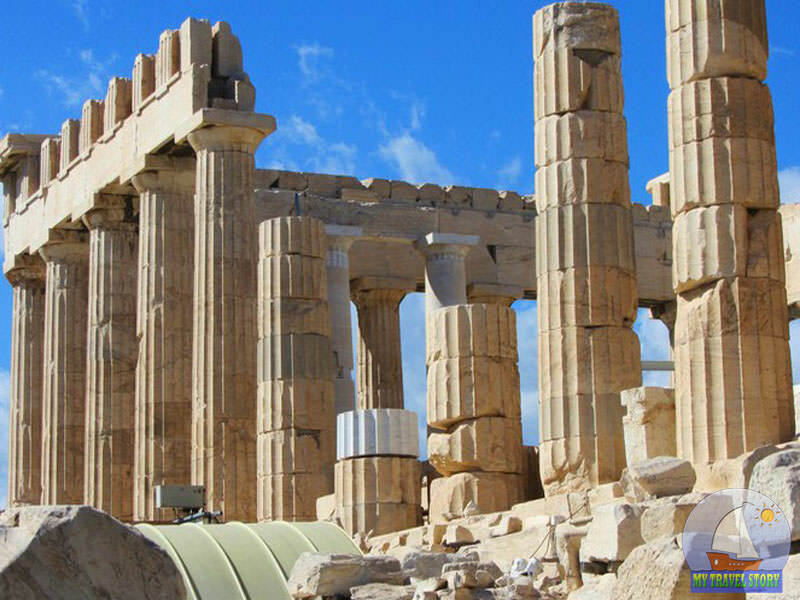 It was erected in honor of the goddess Athena Parthenos conducive victory of the Greeks during the Persian Wars. The initiator of the construction was an outstanding public figure Pericles. Work on the construction and decoration of the temple took place over several years, from 431 BC by 447 BC Place on a hill was chosen by chance. 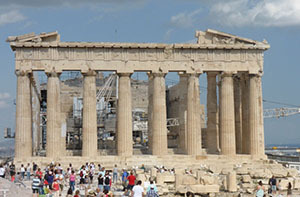 Before the advent of the Parthenon on it was placed earlier temple. Externally, it is a rectangular building with stately columns, tapering upward. For these columns is easy to guess that even then the Greeks resorted to optical illusions. At present, the object under reconstruction. 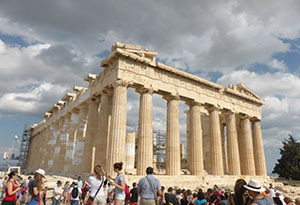 It has a long history of the Parthenon. At various times alternated rulers were replaced and the church functions. The last ruler, who honored Athens, was Alexander of Macedon. After his death, the city is mired in the tyranny, it was often at the mercy of the Roman conquerors, and then the barbarians. During this period, the statue of Athena was lost, and the church burned down. Centuries later, Paul III turned it into a cathedral. Despite the fact that the temple was rebuilt, it still retained the old features. After the Turkish conquest of the Acropolis housed the military garrison and in the Parthenon – the mosque. And even then, no significant changes in the interiors did not happen. According to archaeologists and historians, the temple was a rectangular shape, surrounded on four sides by a colonnade. Columns placed at an angle and represented a classic example of Dorian architecture. Panathenaea festivities were depicted on the inner frieze. Fragments of surviving friezes, mostly stored in the British Museum. Gables buildings were destroyed in the Middle Ages, therefore, restore them it is not so easy. It is believed that on the east side was depicted the birth of Athena, and the west – her struggle for Attica. The most important attribute of the Parthenon, of course, was the 13-meter statue of Athena by Phidias work of genius. Everyone knows that the original sculpture has long burned out, probably in the 5th century BC Today, however, there are multiple copies of varying degrees of accuracy, and one of them is kept in the Archaeological Museum of Athens. Tourists who happen to be in the Greek capital, should definitely visit the Acropolis. It is located in the heart of a 10-minute walk from the Metro station. The main entrance from the street Dionysius the Areopagite. 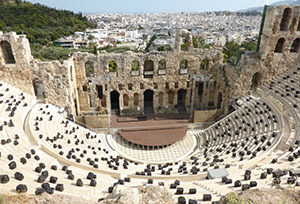 Odeon of Herodes Atticus – ancient building in Athens, Greece; the main concert area of ​​the city. Odeon of Herodes Atticus was built in the II century BC in honor of his late wife. Designed for 5,000 seats, he had the classical form of the ancient theater. Today it is annually held festival of global significance. At one time it was the third largest theater in Greece. It was built with a steep slope and a roof made of expensive wood. Much attention was paid to acoustics. Later, near the amphitheater arch appeared Evmenis which harmoniously complements it. In general, the whole complex is well preserved except for a marble finishes and sculptures, erected by order of Herodes Atticus. This public figure was an outstanding orator and one of the richest men in the country. The erection of such a grand amphitheater he sought to perpetuate the memory of his wife Regilla, through which he became a senator. the south-eastern region of Central Greece, is named in honor of Attica. Near Odeon many other historical sites such as the Parthenon, the Erechtheion. 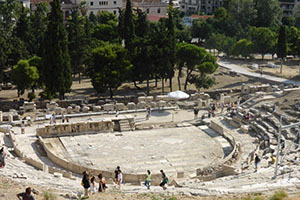 The opening of the amphitheater as the main cultural scene of Athens took place in the 1950s., Immediately after the restoration work. Today, viewers can go inside the Odeon only during what some ideas and exclusively by ticket. 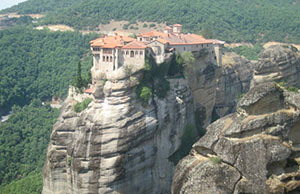 Geographically attraction is located on the slopes of the Acropolis. To get there by bus number 230. Mount Olympus – the highest massif in Greece, which is a national park; according to Greek mythology, the “mountain of the gods.” Crystal clear air, mountain streams, natural beauty – all this made the Olympus paradise for outdoor activities. In the vicinity of the mountains excellent infrastructure, well-trodden routes and at different heights several shelters. 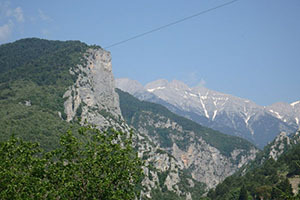 At the peak of Mount Olympus 4, the highest of which reaches 2917 meters and the lowest 2866 meters. Peak Stephanie, the third largest, considered to be the “throne” of Zeus. The entire territory of the mountain declared a national reserve in which an extraordinary diversity of flora and fauna: more than 1,500 plant species, 136 bird species, 32 wild mammals, 20 reptiles. In the forests of Olympus there mouflon, lynx, fox, mountain goats, deer and other animals. 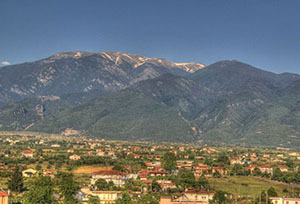 Geographically mountain range located in the north-east of Thessaly, near Thessaloniki. The object is fully open for climbing and hiking tours. Professional climbers on their own climb to different levels of Olympus, but for ordinary travelers have special lifts and well-trodden routes. At the foot of the small town of Litochoro stretches where you can eat and drink a cup of coffee. The most common route to the vicinity of the mountain runs right through it. In Litohoro can be reached by a rented car from Thessaloniki. Travel time – about 1 hour. Also, to the foot of Mount Olympus are regular buses from the bus station in Thessaloniki. Visitors hiking expedition in no hurry to climb the mountain for 1 day. It is a pleasure, as a rule, extends over 2 days, plenty to admire the spectacular gorges of the mountains and watch the wild inhabitants of the forest reserve. Palace of Knossos – the legendary architectural monument on the island of Crete; one of the most visited sights in Greece. It located in the ancient city of Knossos near the capital Heraklion. According to legend, this palace of King Minos built as a labyrinth for the sacred bull-monster Minotaur. 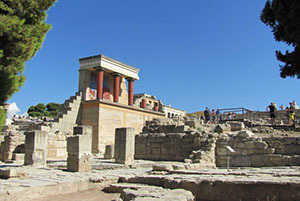 In fact, the Knossos Palace – one of the first skyscrapers in the world. According to archaeological excavations, thousands of years ago it was a multi-storey palace with all modern communications: ventilation, drainage, water supply and artificial lighting. The reason for the destruction of the palace became the strongest volcano. The kind that it has today, the merit of AD Evans. This English archaeologist has devoted much time and effort to the study of Minoan era and architecture. It is believed that the first Minoan palace of Knossos was built in 2000 BC, and the second – in 1700 BC Both of them were eventually destroyed. Today, in their place rise partially reconstructed objects of the second palace. For tourists, this dilapidated palace is of particular historical value. According to the stories of local residents, there was once a labyrinth built for the Minotaur. As it is easy to believe, as a complex system of passages is quite similar to the maze. On the walls and frescoes of the palace you can see the image of the bull, sometimes furious, sometimes good-natured. It is said that people rescued from a son of the Athenian king Aegeus – heroic Theseus. In addition, on some floors there are images of ancient symbols, many scientists are working on that decryption. From the king’s chambers survived three columns with part of the wall. The remains of the complex were discovered in the 19th century. 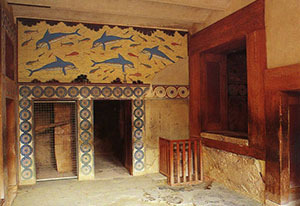 Today, the Palace of Knossos is open to the public daily from 8-9 am. You can reach it by bus from Heraklion to the main bus station or from the fountain at Liberty Square. Theatre of Dionysos – the ancient theater in Athens, Greece; stage on which were first shown the tragedy of the most famous ancient Greek dramatists (Aeschylus, Sophocles and others.) The entire history of world theater, one way or another, connected with this theater. Its origin dates back to the 5th century BC Initially it was wooden and opened twice a year at the time of Dionysius. 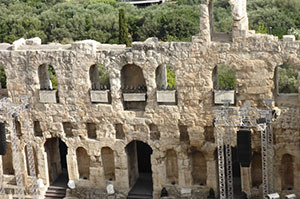 A century later it was rebuilt in stone, and in the period of Roman rule, the theater has been greatly expanded. In this arena were held gladiator fights. Auditorium could accommodate up to 17,000 spectators, and for VIP guests and priests in the front row of marble seats appeared. Many of them have survived carved names. Just above it was located the place of honor of the Emperor Hadrian. According to rumors, he was particularly kind to poetry and theater arts. Then I have been here, and Nero, confident in his theatrical talent. From time to time on the stage arranged between playwrights competition. They were three of the tragedy or drama. Comedy performances also welcomed. The results of the judges recorded in archival didaskaloi. In the I century AD appeared on the scene circus performances. 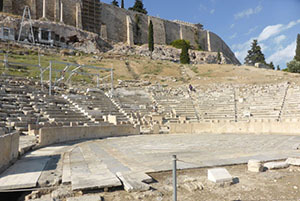 Throughout its existence the Theatre of Dionysos underwent various changes. 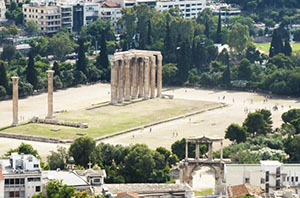 Today it is one of the most visited attractions of Athens. Geographically, it is located near the metro station “Acropolis”. The entrance is from the street Arepagitu. Santorini Island – “the pearl” of Greece; One of the most popular and romantic islands in the Mediterranean region. 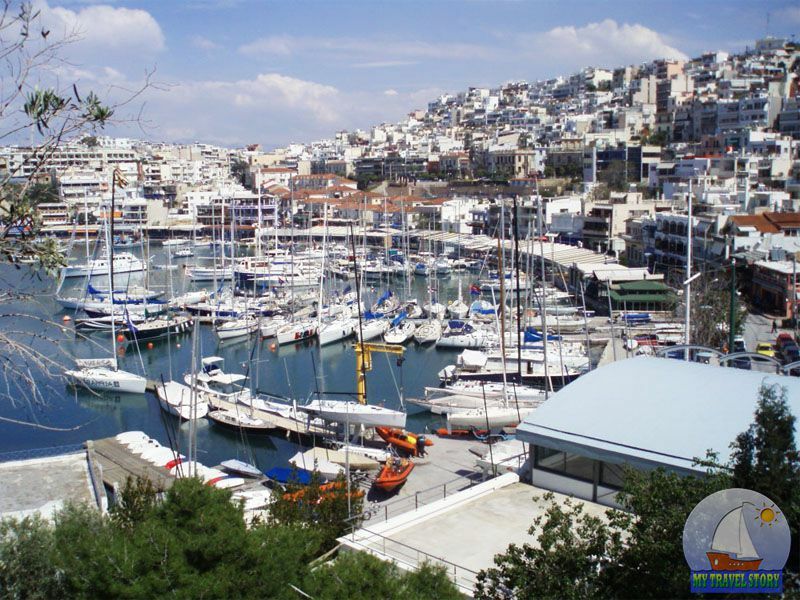 It located in the Aegean Sea on the southern tip of the Cycladic Islands. Santorini beautiful scenery, perfect climate and interesting historical and archaeological sites. Because of its volcanic origin, he was called Pompeii of the Aegean Sea. 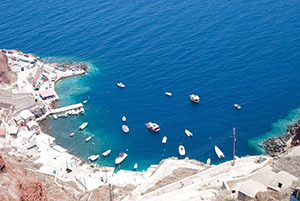 In fact, this small archipelago of five islands, the most important of which is the island of Fira (Thira). City formed on it, is considered the capital of Santorini. Tourists have long liked the magnificent seascapes, clean and beautiful sea, settlement of the blue and white houses, picturesque sunsets and the charming atmosphere of a Greek corner. The population of the largest island is about 13.5 thousand people. The second largest island, terrace, has about 300 residents, and the rest of the island is almost unpopulated. The swimming season lasts from May to November. The island has several large factories for the production of wine. Local residents for a long time cultivated a special kind of grapes from which the wine is excellent. Gourmets will appreciate the gastronomic delights of Santorini. Here grow the white eggplant, capers, fava beans, tomatoes particular grade. All these products are components of the national cuisine. Rich and diverse cultural life of the island. Every year on Santorini are exciting concerts, festivals and religious holidays. One of the busiest is the Jazz Festival in July. In mid-August, the Day of the Assumption of the Virgin, the streets are festivities. 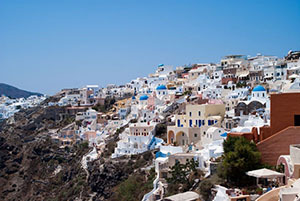 Many people call Santorini – the island of blue domes. Here, every third building is a white-stone church adorned with a blue dome. Total on the island about 300 Orthodox and Catholic churches. Many travelers who wish to visit the “paradise” island arrive at Heraklion airport, and from there in an hour by speed boat get to Santorini. Ferries also depart from Rethymnon, but the journey takes about 4 hours. The Fira (Tyre) has its own airport.